One of the most powerful and unique features of SlashDB is the ability to automatically discover tables, views and relations in databases. 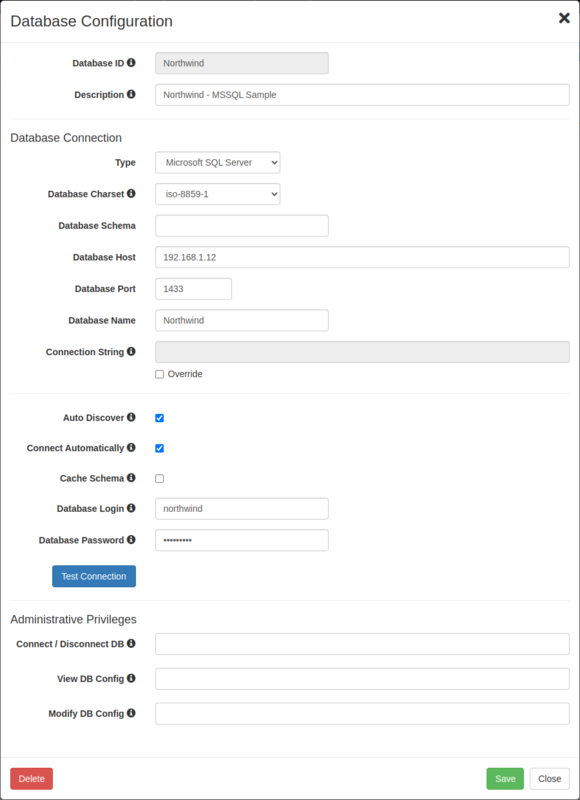 In this section we&apos;re going to connect SlashDB to a sample database and make it usable to user admin. The procedure is fairly simple and will take just a moment. The Database Definitions page provides a list of all data sources available for viewing and interaction. It can be searched using search field above the list or sorted by clicking on headers of the columns. The list is accessible from the main Menu Configure > Databass or direct URL /dbdef. It is available only admin and users with Administrative privilege to view list of Databases. The list can be searched using search field above the list or sorted by clicking on headers of the columns. 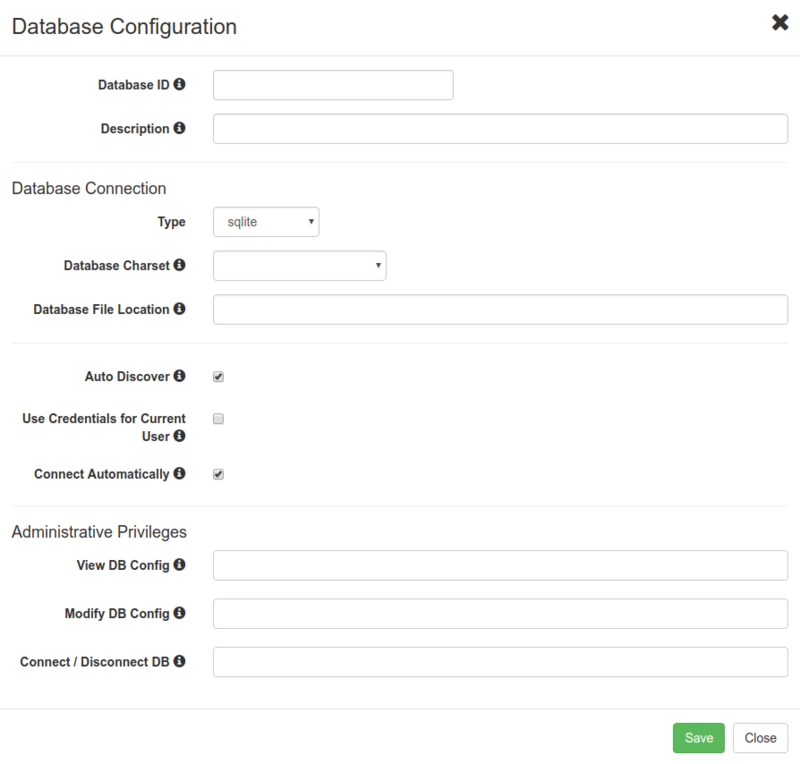 On the list you can find button to edit database details, Database ID, Type, Description, Connection status, button that toggles the state of the selected database and link to JSON representation. 1. Click the in top right corner. The button is not visible when user doesn&apos;t have Administrative Privilege to create new database. 2. The above screen will appear. In the Database ID field give the database a name and a short description in the Description field. 3. Select appropriate database type from the Type drop-down menu and fill out the remaining fields on the screen. Hover your mouse cursor over the icon to learn more about the purpose of the field and configuration tips. Note that depending on the database type selected the list of fields may be different than pictured. 4. When finished click the Save button. If Use Credentials for Current User is selected then on saving another modal will popup showing updated user configuration with mapping to the database defined using Database User and Database Password. Save and close and then Close the configuration of the database. Now the newly added database will appear in the Database Definitions table. Use on Data Discovery /db or Database Definitions /dbdef page to change the Connection status of the database. When something goes wrong while connecting to a datbase, SlashDB will change the Connection status to Failed. If necessary, it will also display a notification bellow the databases list, with more information about the problem. network errors due to a firewall blocking access to the database or network down time - check the firewall and grant access from the SlashDB host to the host and port on which the database server is running. You may need to ask your database and/or network administrator for help.